My ultimate dream is to have my own riad hidden in the Medina of Marrakech. From the exterior it doesn't seem like much, but once you enter you are in an oasis - in a dream. Who doesn't want a secret hideout like that? Until I've saved up enough #honeyschmoney to buy a place in beautiful Morocco, I have a couple go-to spots in the red city. And I'm sharing them today with you! Before heading to Morocco for the first time, I kept on hearing about their magical riads and that it was a must to stay in one for the ultimate Moroccan experience. After reading a couple dozen reviews, Riad Amin ticked off all the boxes for a perfect first Marrakech escape. And it was! The location is perfectly located in the Medina and you're at Jema El Fna square within a 10 minute walk. The staff at Riad Amin are extremely friendly and very helpful to cater to your every need. I surprised my mother with a trip to Marrakech for her birthday and the staff helped me perfectly to provide her an unforgettable, celebratory, experience. The rooms are so beautifully decorated that it seems fit for royals and the hammam spa on the rooftop is divine! This place holds a special place in team House of Notoire's heart because our first HONeys Retreat took place at Riad Zamzam. This gorgeous, British-owned, villa in the Medina was the perfect host. The staff became our family for a week and spoiled us with delicious food, love, and the warmest hospitality. I highly recommend Riad Zamzam for family trips or couple that are looking for a quite escape. The riad is so serene that you forget about the hustle and bustle of the Medina outside of the riad's walls. Looking for opulence? Then hotel La Mamounia (a former palace) is the place for you. Honestly, if I could live here I would. This is one of the most luxurious hotels in Africa and it deserves all the rave. Every inch of this place is gorgeous and you truly feel like a queen staying here. Walk through their gorgeous gardens, take a dip in their larger than life pool, find your zen in their insane spa, be entertained in one of their many bars and restaurants, or catch up on sleep in what might be the most comfortable beds in the world! La Mamounia is worth every penny. And if you can't afford to stay here, then visit it nevertheless to take some gorgeous pictures for the 'gram. For this year's #honeysinmarrakech retreat another breathtaking gem awaits us. 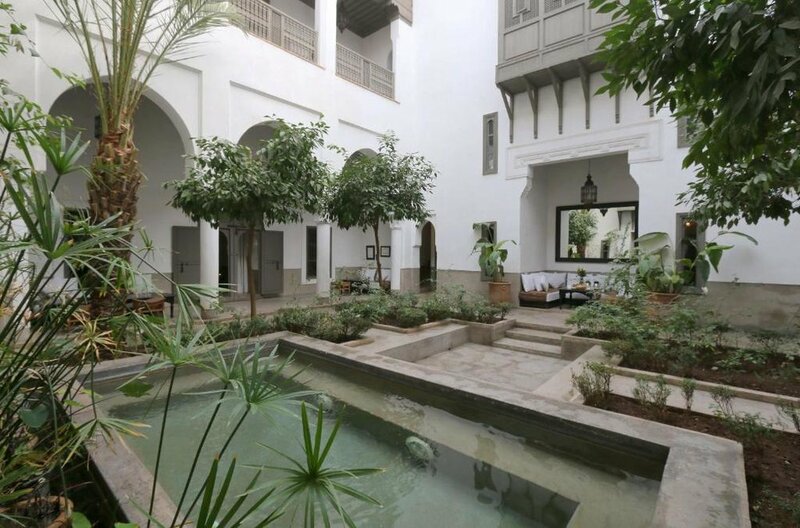 This riad truly is otherworldly and we can't wait to share the experience with you. Want to find out where we're staying and join us to Morocco this November? Save €15 off your next stay via Booking.com if you book with our link.